Created 1856. Organized 1857. Named for W. H. and P. C. Jack, brothers and patriots in the Texas Revolution. 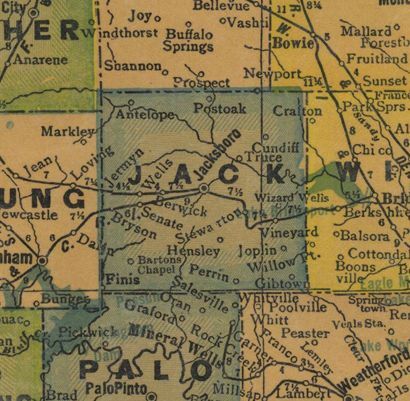 Butterfield Overland Mail, 1858-1861, had 3 stage stops in county. 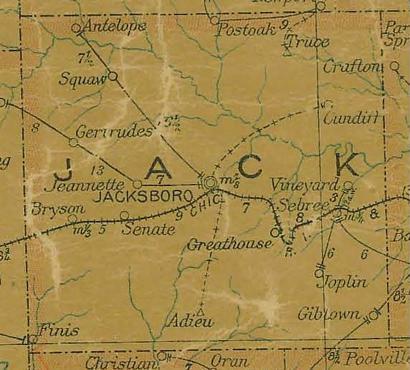 In 1861, Jack County voted against secession, 76-14. Most men fought in frontier units. Some were Confederates; others joined Federal army. Fort Richardson was established in 1867. In 1871 near Jacksboro, Kiowas massacred Warren Wagon Train teamsters. General of the Army W. T. Sherman, then at the fort, sent General Ranald S. MacKenzie, commander, to arrest the Indians. Chiefs Satanta and Big Tree were convicted in first non-tribal trials of Plains Indians in North Texas. 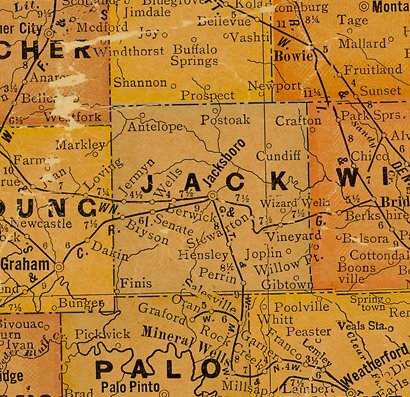 By 1875 MacKenzie's raiders had opened West Texas for settlement. A Corn Club founded in Jacksboro by County Agent Tom Marks on September 8, 1907, was the forerunner of the International 4-H Clubs. Fort Richardson, with 7 original buildings standing, is now a Recorded Texas Historic Landmark. Museum is open the year round. 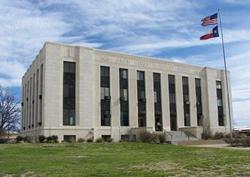 Other attractions include circular high school building and old limestones on square, Jacksboro. Recreation centers about lakes, parks, campgrounds. Economy is based on agriculture, oil, cattle, sheep, and goats.